The Islamic calendar, Muslim calendar or Hijri calendar (AH) is a lunar calendar consisting of 12 months in a year of 354 or 355 days. It is used to date events in many Muslim countries (concurrently with the Gregorian calendar), and used by Muslims everywhere to determine the proper days on which to observe the annual fast (see Ramadan), to attend Hajj, and to celebrate other Islamic holidays and festivals. The first year was the Islamic year beginning in AD 622 during which the emigration of the Islamic Prophet Muhammad from Mecca to Medina, known as the Hijra, occurred. Each numbered year is designated either H for Hijra or AH for the Latin anno Hegirae (in the year of the Hijra), hence, Muslims typically call their calendar the Hijri calendar. The current Islamic year is 1434 AH. In the Gregorian calendar 1434 AH runs from approximately 14 November 2012 (evening) to 4 November 2013 (evening). Muḥarram — المحرّم, "forbidden" — so called because battle was set aside (haram) during this month. Muharram includes the Day of Ashura. Rabīʿ II (Rabīʿ ath-Thānī or Rabīʿ al-Ākhir) — ربيع الثاني or ربيع الآخر, "the second (or last) spring". Jumādā I (Jumādā al-Ūlā) — جمادى الأولى, "the first month of parched land". Often considered the pre-Islamic "summer". Jumādā II (Jumādā ath-Thāniya or Jumādā al-Ākhira) — جمادى الثانية or جمادى الآخرة, "the second (or last) month of parched land". Rajab — رجب, "respect" or "honor". This is another sacred month in which fighting was traditionally forbidden. Ramaḍān — رمضان, "scorched". Ramadan is the most venerated month of the Hijri calendar during which Muslims have to fast from dawn till sunset and honoring the poor people with something a brother or a sister needs within his or her society. Shawwāl — شوّال, "raised", as she-camels normally would be in calf at this time of year. In Arabic, as in Hebrew, the "first day" of the week corresponds with Sunday of the planetary week. The Islamic and Jewish weekdays begin at sunset, whereas the medieval Christian and planetary weekdays begin at the following midnight. The Christian liturgical day, however, kept in monasteries, begins with vespers (see vesper), which is evening, in line with the other Abrahamic traditions. Muslims gather for worship at a mosque at noon on "gathering day" (Yaum al-Jumu‘ah, yawm يوم means ‘day’) which corresponds with Friday. Thus "gathering day" is often regarded as the weekly day of rest. This is frequently made official, with many Muslim countries adopting Friday and Saturday (e.g. Egypt, Saudi Arabia) or Thursday and Friday as official weekends, during which offices are closed; other countries (e.g. Iran) choose to make Friday alone a day of rest, and few others (e.g. Turkey) adopted the Western Saturday-Sunday weekend while making Friday a working day with a long midday break to allow time off for worship. The Islamic tradition is unanimous in stating that Arabs of Tihamah, Hejaz, and Najd distinguished between two types of months, permitted (ḥalāl) and forbidden (ḥarām) months. The forbidden months were four months during which fighting is forbidden, listed as Rajab and the three months around the pilgrimage season, Dhū al-Qiʿda, Dhū al-Ḥijja, and Muḥarram. Information about the forbidden months is also found in the writings of Procopius, where he describes an armistice with the Eastern Arabs of the Lakhmid al-Mundhir which happened in the summer of 541 AD. However, Muslim historians do not link these months to a particular season. The Qur'an links the four forbidden months with Nasīʾ, a word that literally means "postponement". According to Muslim tradition, the decision of postponement was administered by the tribe of Kinanah, by a man known as the al-Qalammas of Kinanah and his descendants (pl. qalāmisa). Different interpretations of the concept of Nasīʾ have been proposed. Some scholars, both Muslim and Western, maintain that the pre-Islamic calendar used in Central Arabia was a purely lunar calendar similar to the modern Islamic calendar. According to this view, Nasīʾ is related to the Pagan practices of the Meccan Arabs, where they would alter the distribution of the forbidden months within a given year without implying a calendar manipulation. This interpretation is supported by Arab historians and lexicographers, like Ibn Hisham, Ibn Manzur, and the corpus of Qur'anic exegesis. It is also corroborated by an early Sabaic inscription, where a religious ritual was "postponed" (ns'ʾw) due to war. According to the context of this inscription, the verb ns'ʾ has nothing to do with intercalation, but only with moving religious events within the calendar itself. The similarity between the religious concept of this ancient inscription and the Qur'an suggests that non-calendering postponement is also the Qur'anic meaning of Nasīʾ. Thus the Encyclopaedia of Islam concludes that the "The Arabic system of [Nasīʾ] can only have been intended to move the Hajj and the fairs associated with it in the vicinity of Mecca to a suitable season of the year. It was not intended to establish a fixed calendar to be generally observed." Others concur that it was originally a lunar calendar, but suggest that about 200 years before the Hijra it was transformed into a lunisolar calendar containing an intercalary month added from time to time to keep the pilgrimage within the season of the year when merchandise was most abundant. This interpretation was first proposed by the medieval Muslim astrologer and astronomer Abu Ma'shar al-Balkhi, and later by al-Biruni, al-Mas'udi, and some Western scholars. This interpretation considers Nasīʾ to be a synonym to the Arabic word for "intercalation" (kabīsa). It also suggests that every second or third year the beginning of the year was postponed by one month. The intercalation doubled the month of the pilgrimage, that is, the month of the pilgrimage and the following month were given the same name, postponing the names and the sanctity of all subsequent months in the year by one. The first intercalation doubled the first month Muharram, then three years later the second month Safar was doubled, continuing until the intercalation had passed through all twelve months of the year and returned to Muharram, when it was repeated. The Arabs, according to one explanation mentioned by Abu Ma'shar, learned of this type of intercalation from the Jews. 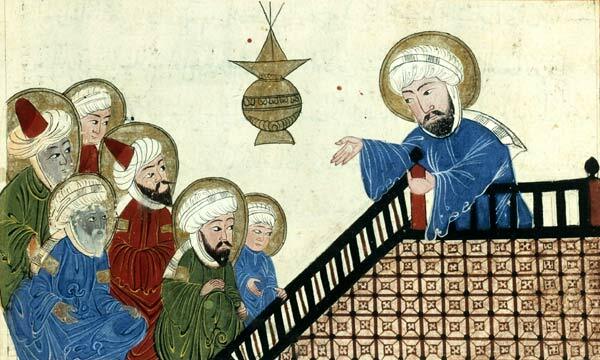 Muhammad prohibiting nasīʾ. Found in an illustrated copy of Al-Bīrūnī's The Remaining Signs of Past Centuries (17th-century copy of an early 14th-century Ilkhanid manuscript). In the tenth year of the Hijra, as documented in the Qur'an (sura 9:36–37), God revealed the "prohibition of the Nasīʾ". This prohibition was mentioned by Muhammad during the farewell sermon which was delivered on 9 Dhu al-Hijja 10 AH (Julian date Friday 6 March, AD 632) on Mount Arafat during the farewell pilgrimage to Mecca. Certainly the Nasi' is an impious addition, which has led the infidels into error. One year they authorise the Nasi', another year they forbid it. They observe the divine precept with respect to the number of the sacred months, but in fact they profane that which God has declared to be inviolable, and sanctify that which God has declared to be profane. Assuredly time, in its revolution, has returned to such as it was at the creation of the heavens and the earth. In the eyes of God the number of the months is twelve. Among these twelve months four are sacred, namely, Rajab, which stands alone, and three others which are consecutive. The three successive forbidden months mentioned by Muhammad (months in which battles are forbidden) are Dhu al-Qi'dah, Dhu al-Hijjah, and Muharram, months 11, 12, and 1. The single forbidden month is Rajab, month 7. The first day of the first month of the Islamic calendar (1 Muharram 1 AH) was Friday, 16 July AD 622, the equivalent civil tabular date (same daylight period) in the Julian calendar. The Islamic day began at the preceding sunset on the evening of 15 July. This Julian date (16 July) was determined by medieval Muslim astronomers by projecting back in time their own tabular Islamic calendar, which had alternating 30- and 29-day months in each lunar year plus eleven leap days every 30 years. For example, al-Biruni mentioned this Julian date in the year AD 1000. Although not used by either medieval Muslim astronomers or modern scholars to determine the Islamic epoch, the thin crescent moon would have also first become visible (assuming clouds did not obscure it) shortly after the preceding sunset on the evening of 15 July, 1.5 days after the associated dark moon (astronomical new moon) on the morning of 14 July. The major Muslim associations of France also announced in 2012 that they would henceforth use a calendar based on astronomical calculations, taking into account the criteria of the possibility of crescent sighting in any place on Earth. Fatimid Dawoodi Bohra follow the tabular Islamic calendar (see section below) prepared on the basis of astronomical calculations from the days of Fatimid imams. In 2007, the Islamic Society of North America, the Fiqh Council of North America and the European Council for Fatwa and Research announced that they will henceforth use a calendar based on calculations, using the same parameters as the Umm al-Qura calendar, to determine (well in advance) the beginning of all lunar months (and therefore the days associated with all religious observances). This was intended as a first step on the way to unify Muslims' calendars throughout the world, in some future time. The Tabular Islamic calendar is a rule-based variation of the Islamic calendar. There exists a variation of the Islamic calendar known as the tabular Islamic calendar in which months are worked out by arithmetic rules rather than by observation or astronomical calculation. It has a 30-year cycle with 11 leap years of 355 days and 19 years of 354 days. In the long term, it is accurate to one day in about 2,500 years. It also deviates up to about one or two days in the short term. 10 Muharram (Day of Ashura) For Sunnis, the crossing of the Red Sea by Moses occurred on this day. (Musa). For Shia, the martyrdom of Husayn ibn Ali, the grandson of Muhammad, and his followers. Conversions may be done online (see list of programmes at the bottom of this page), using the Tabular Islamic calendar (see section above) or, most accurately, through the Jewish calendar, which is accurate to one day in 15,186 years. Theoretically, the days of the months correspond in both calendars if the displacements which are a feature of the Jewish system are ignored. The table below gives, for nineteen years, the Muslim month which corresponds to the first Jewish month. We first find the Muslim month number corresponding to the first month of the Jewish year which begins in AD20874. Dividing 20874 by 19 gives quotient 1098 and remainder 12. Dividing 2026 by 19 gives quotient 106 and remainder 12. The two years are therefore (1098–106)=992x19 years apart. The Muslim month number corresponding to the first Jewish month is therefore (992x7)=6944 higher than in 2026. To convert into years and months divide by twelve – 6944/12=578 years and 8 months. Adding, we get 1447y 10m + 20874y – 2026y + 578y 8m = 20874y 6m. Therefore, the first month of the Jewish year beginning in AD20874 corresponds to the sixth month of the Muslim year AH20874. The worked example in Hebrew calendar#Conversion between Jewish and civil dates shows that the civil date of the first day of this month (ignoring the displacements) is Friday, 14 June. The year AH20875 will therefore begin seven months later, on the first day of the eighth Jewish month, which the worked example shows to be 7 January, AD20875 (again ignoring the displacements). The date given by this method, being calculated, may differ by a day from the actual date, which is determined by observation. ^ Arabic: التقويم الهجري at-taqwīm al-hijrī; Persian: تقویم هجری قمری taqvim-e hejri-ye qamari; Turkish: Hicri Takvim; Urdu: اسلامی تقویم Islami taqwīm; Indonesian: Kalender Hijriah; Malay: Takwim Hijrah. ^ "Appx.15 – PilgrFile: Hajj & `Umrah". The Four Months of Hajj. United Submitters International. http://www.masjidtucson.org/quran/appendices/appendix15.html#pilgrimage. Retrieved 16 August 2012. ^ a b al-Biruni, "Intercalation of the Ancient Arabs", The Chronology of Ancient Nations, tr. C. Edward Sachau, (London: William H. Allen, 1000/1879) 13–14, 73–74. ^ From an illustrated manuscript of Al-Biruni's 11th-century Vestiges of the Past (Bibliothèque Nationale, Paris, Arabe 1489 fol. 5v. (Bibliothèque Nationale on-line catalog). See also: Robert Hillenbrand, "Images of Muhammad in al-Bīrūnī's Chronology of Ancient Nations", in: R. Hillenbrand (ed. ), Persian Painting from the Mongols to the Qajars: Studies in Honour of Basil W. Robinson (Londen/New York: I.B. Tauris Publishers, 2000), pp. 129–146. Calendar Converter: "Islamic" TO "Gregorian"
This page uses content from the English language Wikipedia. The original content was at Islamic calendar. The list of authors can be seen in the page history. As with this Familypedia wiki, the content of Wikipedia is available under the Creative Commons License.